It was the practise of the Holy Prophet Muhammadsa to engage in inter-faith discussions as part of his preaching. Similarly, the Promised Messiahas welcomed any opportunity to discuss matters of faith. In 1896, when Swami Sadhu Shivgan Chandar invited the Promised Messiahas to speak at the Conference of Great Religions, he honoured the invitation, and it led to the publication of a special lecture, entitled, The Philosophy of the Teachings of Islam. In light of these teachings, the Ahmadiyya Muslim Jamaat Canada has always sought opportunities to engage the various faith groups in Canada in inter-faith dialogue. 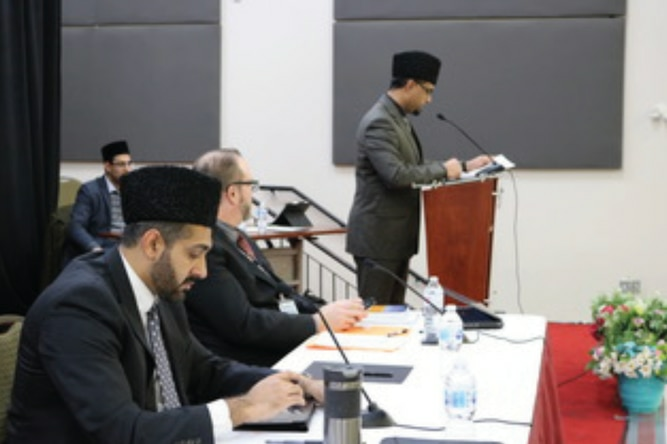 In Vaughan (north of Toronto), the Jamaat has built an enduring relationship with the Maple Community Church, whose current lead pastor is Mr Jason Cleugh. Being neighbors, the Church and our Jamaat maintained regular contact, which ultimately led to the first inter-faith dialogue held nearly 10 years ago at a hall in a school. Since then, five additional programmes have been held at Tahir Hall, next to Baitul Islam Mosque. Over the years, Ahmadi Muslims and Christians have felt that this dialogue enables them to engage in healthy discussions on a wide array of topics related to religion and explore comparisons of Christian and Islamic beliefs. The programme started at 5:30pm after Maghrib and Isha prayers. It was moderated by Sabih Nasir Sahib who first invited Fateen Riaz Sahib for tilawat and then Mr Colin Cleugh for a reading from the Bible. Then, he welcomed everyone to the evening’s programme and gave some initial comments. After that, the Ahmadiyya Muslim perspective was presented by my humble self for 25 minutes. During the address, I made the case in the affirmative, and presented several references from the Bible and the Quran which express similar attributes of God. In essence, the God of the Biblical prophets is the same God Who sent the Prophet Muhammadsa, and He is also the God of Jesus Christas. It was also shown how Jesusas is not divine as he did not demonstrate the attributes that God has, in his own self. This presentation was followed with a 25-minute presentation by Mr Tony Costa, an apologist and professor of Toronto Baptist seminary. Mr Costa argued in the negative and tried to make the case that the God of the Bible is not the God of the Quran. This was followed by 7 minutes of comments by each of us, and then an open question and answer session. 25 questions were asked, out of which 17 were addressed to Mr Tony Costa. The programme ended at 8:30pm with closing comments followed by silent prayer. A total of 365 people attended the event. The dinner arrangement that followed gave the guests an opportunity to mingle with one another and discuss the topic of the day and other related topics. Some discussions lasted well into the night. By the grace of Allah, many guests appreciated the event and the intriguing dialogues it led to. It is our earnest prayer that Allah keeps on giving the Ahmadiyya Muslim Jamaat even greater opportunities to spread the message of Islam Ahmadiyyat to all the people of Canada, and to the whole world. Amin.